The star-formation feedback onto the parent cloud is conventionally examined through the study of molecular outflows. Little is however known on the effect that atomic ejecta, tracing fast shocks, can have on the global cloud properties. 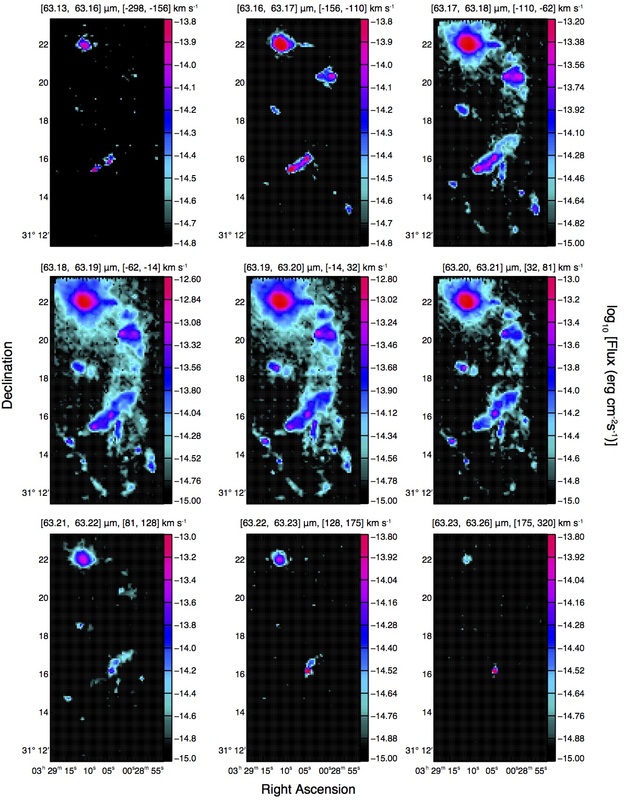 In this study we employ Herschel/PACS [OI] and [CII] spectral line maps of the NGC 1333 star-forming region to assess the relative influence of atomic jets onto the star-formation process. Atomic line maps are compared against molecular outflow tracers and atomic ejecta are associated to individual driving sources. We study the detailed morphology and velocity distribution of [OI] line using channel and line-centroid maps and derive the momentum, energy, and mass flux for all the bipolar jets traced by [OI] line emission. We find that the line-centroid maps can trace velocity structures down to 5 km/s which is a factor of ∼ 20 beyond the nominal velocity resolution reached by Herschel/PACS. These maps reveal an unprecedented degree of details that assist significantly in the association and characterization of outflows. Comparisons of the dynamical and kinematical properties shows that [OI] momentum accounts for only ~1% of the momentum carried by the large scale CO outflows but the energy released through the jets corresponds to 50 – 100% of the energy released in outflows. The estimated ratios of the jet to the outflow momenta and energies are consistent with the results of two-component, nested jet/outflow simulations, where jets are associated to episodic accretion events. Under this scenario, the energy from atomic jets to the cloud is as important as the energy output from outflows in maintaining turbulence and dissipating the cloud gas. The preprint of the complete article can be found here.